As a regulated Broker NSFX Mt4 Broker is a true clean brokerage that is looking to the a boutique broker that concentrates more on the clients in quality then quantity. The company’s technological infrastructure was built with a deep understanding of trader’s ongoing needs. Combined with strong connections within the banking system and with liquidity providers, NSFX MT4 Forex Brokerage offers one of the best trading experiences in the market today. NSFX MT4 Broker has earned the tile of Best MT4 Broker due to the fact that they have been around for sometime now and have one of the cleanest records when it comes to Broker Behavior towards their clients. With NSFX MT4 Trading Brokerage there is a choice of three different accounts to start with, and it’s very easy to compare the three as there is a very clear comparison table on the site. Standard NSFX MT4 account – Initial minimum deposit is $300 USD, and there are more than 50 currency pairs, commodities, and indices. Leverage is up to 1:200 and spreads are fixed. Minimum trade is listed as 0.01 lots. Professional NSFX ECN account – Minimum deposit requirement is $3,000 USD and the number of instruments for trading is the same as a standard account. Leverage is up to 1:100 and spreads are variable. NSFX VIP account – A $50,000 deposit will get you a VIP account that offers fixed or variable spreads. Leverage can be arranged by getting in touch with NSFX. There is are a couple of additional benefits for VIP account holders. These are a personal account manager available for support and guidance, and monthly account performance analysis. The demo or practice account of NSFX MT4. Open one of these and you’ll be credited with $100,000 in virtual money to help practice your trading. Forex Islamic Account for those that require to trade under Sharia Law they offer a full Halal account that will not charge swaps or any other fees. We’ve already covered the various assets available for trading, but there are a number of other qualities worth mentioning. NSFX offer a number of free trading tools to help traders decide which trades to make. MyNSFX is a personal account management console that is also worthy of a mention. It provides access and engagement in all trading aspects, and complete control over your own trading experience. Clean and understandable technical and fundamental analysis pages that are updated on a daily basis. .
they have a Blog with all the information you need and want to know about the company , they believe in transparency and this shows. 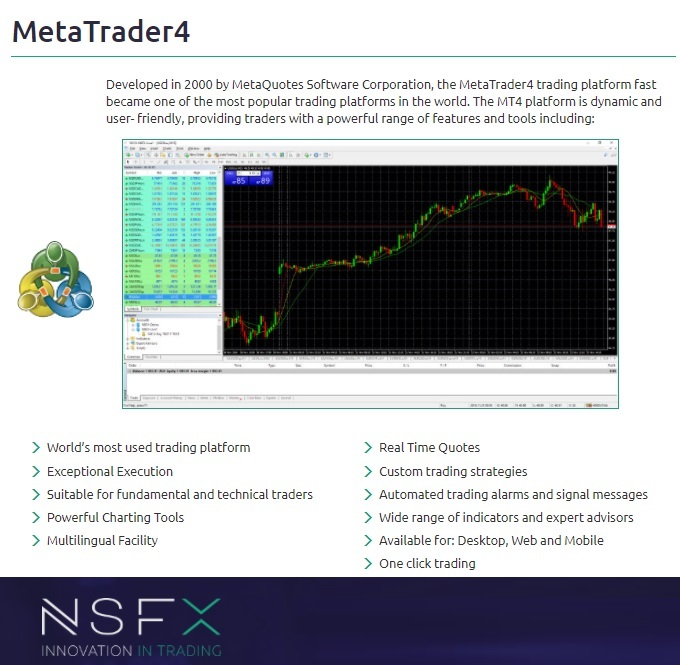 NSFX MT4 Educational Material For the Beginner And More Experienced Traders Alike. NSFX have an Academy which is open for all skill levels. But it was mainly designed for those traders who are taking their first steps within the world of forex trading. At the Academy you can learn all the basics of Forex trading, as well as receive 1 on 1 training which will serve to advance your trading skills, knowledge, and help you to develop a strategy. in additiona there are other resources available like an e-book download, webinars, a Forex course, and video tutorials. NSFX supports a number of different payment methods including wire transfer, Visa and Mastercard, Skrill, and American Express. No fees are charged for deposits and withdrawals, apart from Skrill which incurs a 3% charge on withdrawals. Customer support is available from a number of different international locations, including Spain, Bahrain, and Russia, along with email support and a live chat option. The opening hours are much the same as many other brokers, Sunday 21.00 GMT until Friday 22.00 GMT. NSFX allow Scalping,Expert Advisor,Trailing Stop,One Click Execution,Hedging for their traders.Traders can get most trading advantage with this broker. They provide Fixed and Variable spread.Traders can trading with MAMaccount.They don't accept swap free account so you can't swap free account. NSFX offer Standard MT4, Professional ECN, VIP Account for their traders. Traders can choose their trading account according to their requirements and investment. NSFX Ltd. holds a Category 3 investment services License no. IS/56519 issued by the Malta Financial Services Authority (The MFSA).They also regulated by ACP,BaFIN,CNMV,CONOB,DFSA,FCA,MiFID. NSFX offers MetaTrader4 to their clients. Traders can also trading with web trader.